We are excited to announce the recent launch of our all-new grant resource! 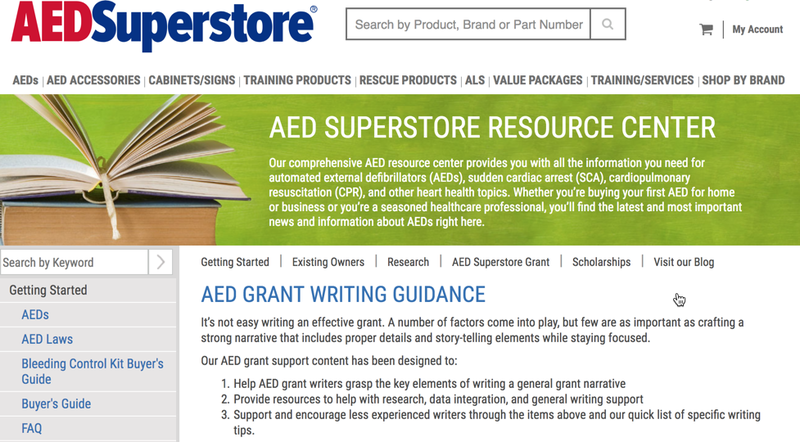 If you’ve been a reader of our blog, you probably know that AED Superstore offers our own AED grant worth $2,000 twice a year. If you’re looking for help with funding an AED purchase, it’s a great place to start. We knew it was just one option among many possible funding sources, and with so many worthy causes applying for our grant, we wanted to do more to connect people and organizations with help in getting an AED. These pages contain lists of grants for the specific audience, so the fire/EMS grants page has a list of grants that are either a) specifically for AED purchases for fire departments and emergency medical services, or b) should cover an AED, even if that’s not the stated intent of the grant (it might be something like general equipment or medical equipment). We already have more categories in development, including grants for youth sports teams, churches, small businesses, and other groups. If you know of a grant for these or other categories, let us know so we can add it to the list. If you contact us with a grant to submit (either one you found, or if your organization offers a grant) and we add it to our list, we’ll give you a discount of 10% off AED accessories and/or $100 off an AED. Please see the discount instructions at the end of the article. These grants will be reviewed on a regular basis to make sure they’re still available and applicable for AEDs. You’ll see an “Updated on” date at the bottom of each list, so you’ll know how fresh the grants are. If there’s a grant that’s been changed or discontinued, we may still include it in the list, but with a note on its status. In addition to developing these lists of grants to help you find funding for an AED, we created several other helpful tools if you’re seeking grant funding. This list of frequently asked questions about AED grants will provide answers if you’re just getting started in the world of grants and funding. There’s a lot to learn, but winning grant funding for your AED purchase is a worthwhile cause to invest in. If you’re past the basics of learning about applying for grants and you’re ready for some help in actually writing proposals, we’ve also developed this detailed AED grant writing guide. It’s long and in-depth, and it contains examples of how to phrase, answer questions, gather supporting data and generally make a good case for why you should win the grant. There are also some good grant-writing tips and a list of grant-writing resources to help you get your funding. Our grant writing support services has a great list of even more helpful tips, tricks, examples and other types of support from quality websites. The advice from these articles will ensure that the time you invest in composing your grant proposal is well-spent, and you create a proposal that’s taken seriously. Is 9/4 final date for grant submission, I just got the email today 9/19? I see where you got that idea. September 4 was the publication date of the article, but it looks like it’s part of the bullet points above it. The deadline for the current $2000 AED grant AED Superstore is offering is November 30, 2018. You can find that one here. If you are interested in receiving the coupon code by submitting a link to a grant, that offer has no expiration date.